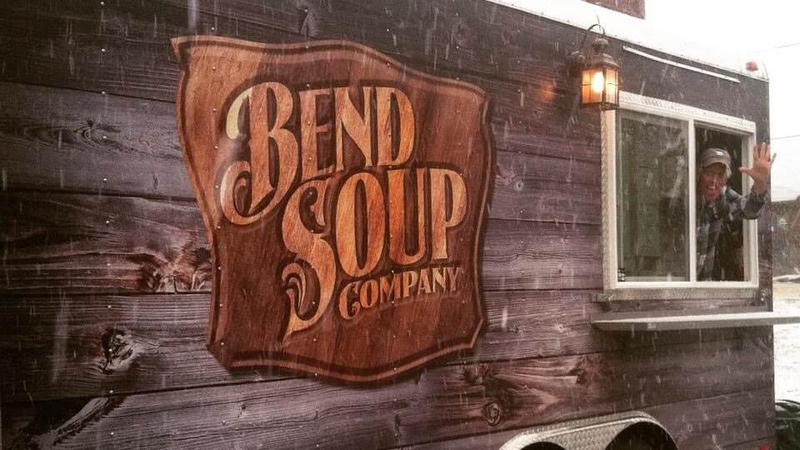 The Bend Soup Company food cart hangs out in the Century Center off of SW Century Drive on Bend’s west side. Specializing in delicious homemade soups and sandwiches, with at least three spectacular soups available every day. You can create your own grilled cheese sandwich with their 15 options of cheeses and toppings or try their popular Oven Roasted Turkey Breast Sandwich on 21-grain bread. They also sell an assortment of chips and drinks (non-alcoholic), as well as a Mad Greek salad in two sizes with or without chicken. Outside seating around a couple of beer barrels and stools is provided in their dog-friendly parking area. Call ahead to see what soups they have, check out their menu on Facebook, or subscribe to their Twitter feed that they update each morning. Open Monday – Friday from 11:00 a.m. – 3:00 p.m. and Saturday from 11:00 a.m. – 2:00 p.m.